Different habitats may impose different limitations on how acoustic communication signals are sent and received. For example, think of how you change your voice when talking to someone at a loud party versus in a quiet cafe. Animal vocalizations are no different and may be under similar pressures to alter their vocalizations in response to different habitats. This idea that animal vocalizations should adaptively respond to the transmission properties of the habitat in which they occur has been termed the acoustic adaptation hypothesis. This hypothesis predicts that vocalizations produced in closed habitats, such as forests with lots of vegetation, should be longer and have lower frequency or pitch than vocalizations produced in open habitats, such as meadows or marshes with little vegetation. These predictions come from the idea that the vegetation may hinder the transmission of sound waves and, therefore, different strategies may be required to get a signal through a dense forest than an open meadow. Furthermore, anthropogenic noise, such as road noise, is pervasive across the world. Vocalizations are especially at risk of disturbance from anthropogenic noise through either distraction (like when a loud background noise distracts you from a conversation) or from masking, where the background signal drowns out the communication signal (like trying to have a conversation at a rock concert). Because of this, research into acoustic communication signals has shown that many animals, including birds and frogs, are able to avoid masking from low-frequency anthropogenic noise by increasing the frequency of their vocalizations to avoid overlap. Therefore, another prediction of the acoustic adaptation hypothesis is that the frequency of vocalizations produced in the presence of anthropogenic noise should be higher than vocalizations produced in natural habitats without anthropogenic noise. Mobbing calls are acoustic signals given by birds and mammals in response to predators. They are an important type of vocalization to look for frequency shifts because their acoustic structure differs widely across species, they are important for survival and thus likely experience consistent selection for optimal transmission, and very few studies have explored the role of habitat in the shaping the acoustic structure of mobbing calls (most have focused on birdsong). Generally, although not always, mobbing calls have a broadband acoustic structure (meaning they cover a large range of frequencies), a loud, harsh sound and a sharp onset and termination. Like birdsong, each species has a specific mobbing call, which functions to attract other individuals, both conspecific and heterospecific, to the location of the caller to assist in harassing and mobbing to drive a predator from the area. Using mobbing calls from three families of songbirds (the thrushes (Turdidae), the blackbirds (Icteridae) and the crows and jays (Corvidae)), I tested whether mobbing vocalizations differed across three broad habitat types: closed, open, and urban habitats. I did this in a phylogenetic comparative context, which means I controlled for phylogenetic relatedness because species that are more closely related are more likely to be similar. I found that two distinct low-frequency measurements differed across the three habitat types. First, 5% frequency, which measures the low-frequency energy distribution, differed between species classified as occurring in predominately open or closed habitats. Species classified as residing in closed habitats had lower 5% frequency than species classified as residing in open. This means that species residing in closed habitats put more power or energy into their lower frequencies than species classified as residing in open habitats. Therefore, this finding supports the prediction that species in closed habitats have lower low frequencies than species in open habitats. Additionally, I found that species classified as urban species (think American crows, American robins, great-tailed grackles, etc.) had a lower minimum frequency, which is the lowest frequency of vocalization. 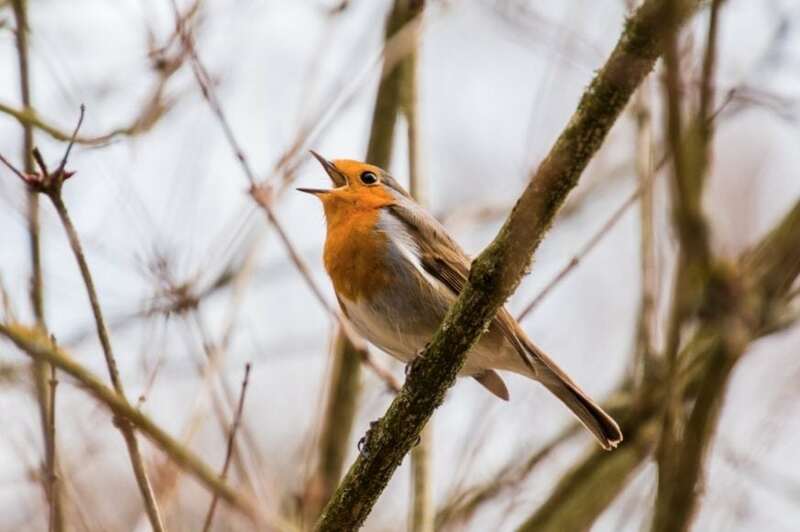 This directly clashed with the prediction of the acoustic adaptation hypothesis and previous findings for birdsong, that species appeared to shift lower minimum frequencies upward, likely to avoid masking by anthropogenic noise. Because this finding is the opposite of the prediction and previous research, I confirmed this finding by measuring low frequency another way (using power spectra with an amplitude threshold, called the threshold method) and confirmed the same result: species classified as residing in urban habitats had lower minimum frequencies than species classified as residing in open or closed. Taken together, these results support the acoustic adaptation hypothesis that possible habitat pressures may be affecting acoustic structure in closed and open habitats by selecting for low-frequency mobbing calls in closed habitats or higher frequency mobbing calls in open habitats. But, what is happening in urban habitats? We’re not sure. There is another study by a group in Australia (Potvin and colleagues, 2014) that found silvereyes, another songbird, had lower low frequency in their mobbing calls in the presence of anthropogenic noise, similar to my finding, but shifted the low frequencies up in their song in the presence of anthropogenic noise, as seen in other birdsong studies. This suggests that mobbing calls may be under a different selection pressure to combat anthropogenic noise. As mentioned, they tend to be broadband, so even if the lower frequencies are masked, a lot of the signal is not masked and can transmit. The human voice is somewhat broadband as well. Think of standing next to a busy freeway. You can still have a conversation, but how? You can shift your pitch up (like a song) or you can yell (increase your amplitude), so it is possible that urban species just call louder, but this remains to be explored. It is important to understand how animals are able to function in urban settings as they are the fastest growing habitat type in the world. These findings are described in the article entitled The low-frequency acoustic structure of mobbing calls differs across habitat types in three passerine families, recently published in the journal Animal Behaviour. This work was conducted by Alexis C. Billings from the University of Montana. I am currently a postdoctoral researcher at the University of Nevada – Las Vegas. I study the ecology and evolution of animal communication signals. I apply an information theory framework to understand how and why animals communicate. I use a combination of lab and field experiments along with signal analyses to understand how animals use signals and how these signals are maintained by evolution. See my Projects tab for up-to-date information about what I am working on!